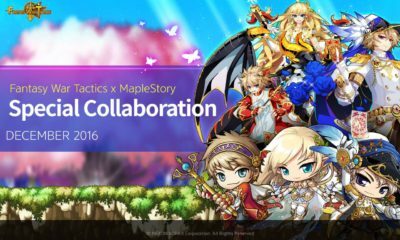 Recently, NEXON Korea Corporation released an update that brings together Fantasy War Tactics and MapleStory. As an up-and-coming magician, players can pioneer their way through Fantasy War Tactics using the abilities of their characters, the environment, and the support of their friends. The "Fantasy War Tactics x MapleStory Collaboration" introduces three new characters in the popular MMORPG MapleStory, as well as a new area in Hell mode: the Tower of Dawn. In addition, players can explore a whole new landscape from the Maple World - Lost Island - for a short time. In the special event shop, exclusive items can now be purchased as a souvenir of the MapleStory collaboration. Three iconic Heroes from MapleStory: Unleash and recruit three of the six legendary heroes from MapleStory: The best thief ever, Phantom; Archer and ruler of the elves, Mercedes; And the inconspicuous peasant boy Evan, who became the master of the dragon. Phantoms Explore Lost Island: Players can travel to the event dungeon "Phantoms Lost Island", where they have the opportunity to fight against hordes of enemies for great rewards (available until January 19). Rewards for Activity: Everyone who logs in during the Collaboration receives a â˜… 3 to 5 reward and 1000 Perfect Genes daily (up to four times) (available until 31 January). MapleStory Event Shop: Exclusive items, such as the limited "Marine Boy Evan' costume for Evan, can be purchased at the Event Shop (available until 18 January). Google Play and the App Store can now download the update free of charge.